Sporting an immaculate reputation among protein powder supplements Optimum Nutrition Gold Standard 100% Whey is a popular product with those looking to maintain or increase muscle mass. It uses whey protein isolates, the purest form of whey protein, as its main ingredient in order to pack in as much protein as possible while leaving out things your body doesn’t need. The combination of whey protein isolates and whey protein concentrates gives you 24 grams of protein in each serving. 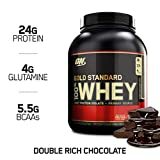 Gold Standard 100% Whey is manufactured by Optimum Nutrition, a highly respected producer of fitness supplements, and has been one of their best-selling products since it was first introduced in 2005. The powder instantly mixes by stirring or shaking it to create a shake. Optimum Nutrition calls it the “gold standard,” meaning that it is the best in the industry, and it has certainly proven to be popular among consumers. Does the product live up to its reputation? Find out below what the pros and cons of this well-known supplement are. 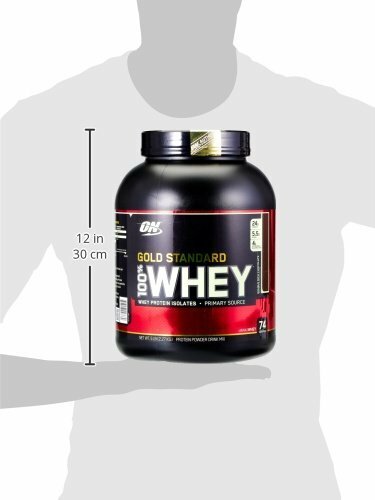 Like all Optimum Nutrition products, Gold Standard 100% Whey is produced by the manufacturer. Many companies import their raw materials, making the quality questionable. Factories that make cheese, the source of whey, may not be properly regulated in some countries. With Optimum Nutrition products, you know you’re not getting unwanted residues like heavy metals or cow hormones. A benefit of using primarily whey protein isolates is that harmful products such as cholesterol, fat and lactose are left out. This is especially important for those who are lactose intolerant, but also a benefit for anyone who works out regularly, and thus takes this supplement regularly, because it means that they won’t be putting harmful substances into their body. Gold Standard 100% Whey is approximately 81% protein, which is very high and a great value considering the cost. It is, of course, a lower content than you’ll find in a supplement made of pure whey protein isolates. The reason for this difference is that the ion exchange process, the means by which whey proteins are separated, is an expensive process. This is why whey protein concentrate is used as a secondary ingredient. This keeps costs down, making the product more affordable while not taking away from its muscle-building benefits. Since the second ingredient is whey protein concentrate, there is some lactose in each serving, but lactase is included as an additive to help break it down in the body. Along with the 24 grams of protein in each serving are approximately five grams of branch chain amino acids (leucine, isoleucine and valine). This is a benefit for users because muscle tissue is largely comprised of these amino acids. Calorie content varies depending on the flavor, but the highest calorie count is only 10. Again, this is important for those who will be using the product on a regular basis because it allows them to put on only muscle weight. The powder mixes almost as soon as it touches the water. It can be mixed with a spoon or in a shaker, and so far, I haven’t had any problems with the powder clumping together. One problem with this supplement is that it contains artificial sweeteners. Depending on the flavor, it might contain sucralose (strawberry), acesulfame potassium (chocolate) or other additives, and this isn’t made clear on the labeling. Fitness buffs are careful about what they put into their body, so this could be a problem for some. Of course, the reason for this inclusion is to improve the flavor because whey alone has an unpleasant taste. Also, many of the flavors, cake batter in particular, just seem “off.” Many users report tastes anywhere between bitter medicine to overly sweet, though most have no problem with the taste at all. Most likely, it’s a matter of personal taste. Of course, the purpose of a supplement it to build body mass, not to be delicious. It can always be mixed with other ingredients for a nice smoothie. Gold Standard 100% Whey has been on the market for several years and comes highly recommended by fitness experts and long-time users alike. This shows that it has given them proven results over the long term. While the main complaint about this product is the taste, this doesn’t seem to be an issue for most. Other products such as Isoflex can claim to have 90% protein content per serving because their protein source is only whey protein isolate. Users with extreme lactose intolerance may prefer this alternative, but for most people, the added protein probably won’t convince them to pay more than twice the price. In its price range, Gold Standard 100% Whey is one of the most solid and proven whey protein powder supplements on the market. Its high protein, low calorie content make it a product that anyone trying to gain or maintain muscle mass should try out.